You are looking for a warm and elegant jacket in fine material ? It is a jacket in wool that you need. It offers you a fine, warm and elegant material to wear daily. OSCALITO, an Italian brand specialist in wool and silk, offers you jackets in wool and silk of superior quality. 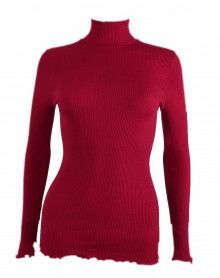 This brand, at the same title of MORETTA, offers you sweaters in wool and silk that you can also wear with a pair of jeans or casual pants. Vests, sweaters, jackets There are 20 products. Wool and silk Moretta lingerie is manufactured in Italy. 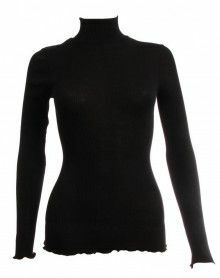 This tank Moretta in finishing is composed of 85% wool and 15% silk for comfort to wear. This Oscalito model offers a sober and elegant funnel collar. This Oscalito top is entirely made in Italy. This Oscalito model offers a sober and elegant stand-up collar.This Oscalito top is made entirely in Italy. This Oscalito model offers a pass amount sober and elegant. This Oscalito top is totally made in Italy. This Sweater Oscalito model offers a pass amount sober and elegant. This Oscalito top is totally made in Italy. This Oscalito model offers a sober and elegant stand up collar. This Oscalito top is totally made in Italy. Ghiaccio color. Oscalito "Elegante" Blouse. Sizes 2 to 5. This Oscalito top offers pleated seam in soft and comfortable wool and silk with a wonderful upper part in macrame. This tank top is in 100% thread of Scotland and offers small lacework in Leavers. The ready-to-wear universe from MesDessous.fr offers a collection of waistcoats, pullovers and jackets carefully selected among the famous lingerie brands or specialists in wool and silk underwear. You will find pullovers and sober waistcoats, to wear everyday in noble and natural materials. The OSCALITO pullover in wool and silk in pleated material will delight you by its elegance, its comfort and its well-being. To wear every day without moderation. 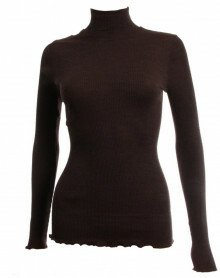 In the same style, you can also enjoy MORETTA wool and silk sweaters with an excellent value for money. 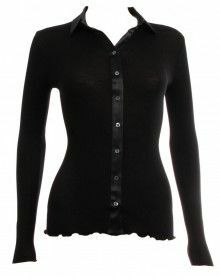 For your dressed outfits, you can opt for OSCALITO pullovers worked with luxurious lace. This stunning Italian ready-to-wear brand of wool and silk delights season after season demanding customers who look for warm, elegant and comfortable sweaters or vests .